Using a Remy propulsion electric motor, Lightning Motorcycles, LLC. blasts through the land speed record for production electric bikes by 30mph to be crowned the first electric bike in the world to exceed 200mph. In an August 14 SCTA*-sanctioned run at the Bonneville Salt Flats in Utah, Lightning -- the 2010 land speed record holder -- achieved 206.079 mph, topping its 2010 speed of 176mph. Lightning retains its claim as the fastest electric bike in the world in its class and will eternally own the achievement of being the first electric motorcycle to break 200mph in its class. The bike was ridden by Paul Thede, principal of Race Tech and the developer of the Lightning suspension system. This record speed win coincides with the signing of a long term supply agreement in which Remy International, Inc. will provide Lightning Motorcycles with the Remy HVH250™ electric propulsion motor for use in Lightning Motorcycles' commercial electric motorcycles and its professional racing Lightning Superbikes. Lightning Motorcycles is a California-based motorcycle engineering firm using competition to spur innovation. In addition to its commercial bikes now sold in North America, Asia and Europe, Lightning is already manufacturing their winning Superbikes with a Remy HVH250 motor for sale. "Lightning Motorcycles has the drive and talent to keep pushing the electric bike land speed record higher with the Remy HVH250 electric motor. 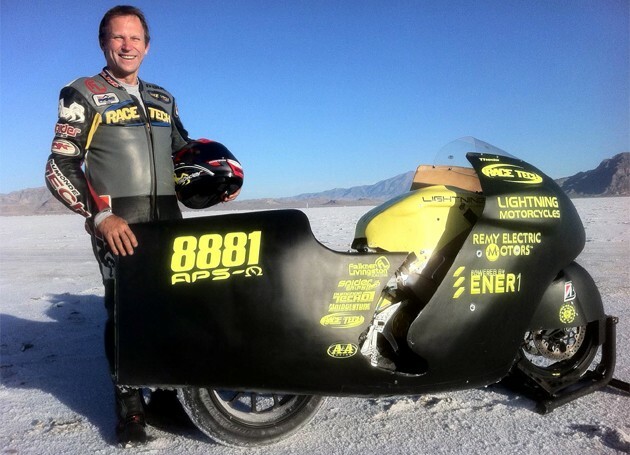 We are very proud to be a part of Lightning's amazing record at Bonneville," said Remy Electric Motors, LLC VP and General Manager Kevin Quinn. "The Remy HVH250 motor is the best on the market. Our team works hard to give our customers the competitive power advantage they need; it is dazzling to see it in triumphant action like this," added Quinn. "Switching to a Remy electric motor made a powerful difference in our design and performance. Coupled with our experienced team, we knew we had a record-breaking bike on the Salt Flats. Remy has been a tremendous partner in our efforts. We look forward to working with them and their motor on both our racing and commercial bikes," said Lightning Motorcycle CEO Richard Hatfield. The compact size and light weight of the Remy HVH250 electric motor is a perfect match for the Lightning Superbike. The Remy HVH250 provides the superior power density and performance required by Lightning Motorcycles while fitting into the limited space of this small but powerful application. Efficiency and range are also gained through the reduced weight of the lighter Remy electric motor, which decreases overall application weight with no sacrifice in power or durability.